Developing your brand and earning market share is neither easy nor inexpensive. When a customer walks down an aisle in virtually any type of retail outlet, he or she expects to be able to spot a product or product line by the packaging your marketing team undoubtedly worked hard to develop—packaging that quickly and easily differentiates your products from the competitors’ offerings. Whenever you change the size, shape or color of your logo or label or packaging—anything that has been a key identifier of your brand—you risk losing that familiarity and even, perhaps, affinity for the product. It no longer has that familiarity they seek and may have even been the reason a customer decided to “try you out” to begin with. Case in point, when incorporating luxury packaging into wine and spirits packaging, the product may be the same as the nonluxury packaged item next to it but the nicer looking packaged item will fly off the shelves. There may be no difference in the product but the more luxurious looking product will give off a sense of superiority. What made a customer reach for a product? It is often an unusual shape, color, texture, or design of the packaging. Many consumers are committed to buying products from a company that takes steps to protect the environment or a product made with high-quality materials. The message to consumers from the packaging signals they are purchasing a superior product. Making your packaging come to life is essential in establishing it as a superior product. Luckily, it’s easy to create visual fluidity and movement through a unique combination of substrates and finishes. On top of that, one of the best ways to do this is with gradients. Gradients can add a futuristic and fluid-like feel to any packaging. These effects are the perfect way to make your packaging pop in a unique way while incorporating visual fluidity and innovative movement. A gradient, in design, is a progressive change in color that stimulates the eye to look at an entire package. 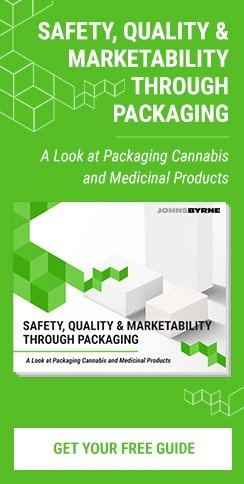 Folding cartons – The standard for so many products, JohnsByrne is known for its innovative approach to taking that standard to new levels and creating high impact with consumers at point of sale. Adding gradient color from, say, a pale blue to a darker blue, or a light amber to a hot pink can maintain brand identity, while bringing new and even more attention to your product. Cold foil – Cold foil, consists of applying an adhesive to a substrate, then pressing the foil carrier film onto the substrate. 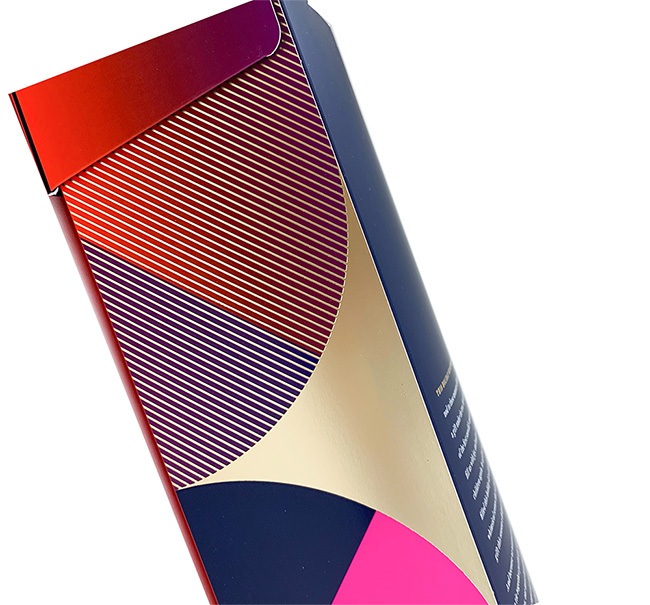 New technology has made it far easier to work with, creating a vibrancy that makes cold-foiling stand out against the competition’s packaging. With cold foiling, it’s possible to portray gradients with ease. Vignetting – Let’s say you found the perfect image to represent your brand or product and there is no reason to change it, but you’re looking for a way to give it new life. Using gradients could be the answer. The technique allows you to keep the same saturation at the center of the image, while reducing the image’s brightness or gradually changing the color, moving off the central portion of the image to the periphery, with a gradual shading. Imagination and innovation are at the heart of everything we do. Whether the idea of using gradients to retain, essentially, what you have while creating a new look seems appealing or you’re looking for something completely new, call us to discuss your next project.